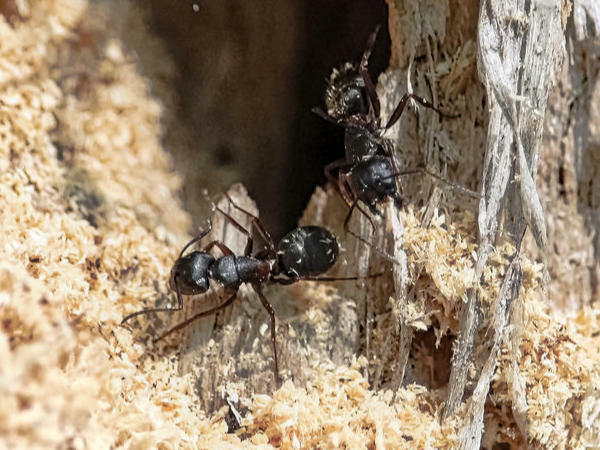 Carpenter ants comprise several species of highly-social ants in order Camponotus who excavate galleries in wood in which to lay eggs and raise their young. They do not eat the wood. They just excavate galleries in which to lay their eggs. Depending on the specie, carpenter ants range in size from about 3/8 of an inch to slightly more than an inch in length. Most carpenter ant species are predominantly black in color, but there are variations including reddish, brownish, and deep blue. The ants in the picture here are building a nest in a tree. Note the sawdust from the ants' excavation. Exterminators call this "frass," and it's one of the things they look for when diagnosing a carpenter ant problem. In buildings, carpenter usually build their nests in void areas with a rather high humidity level, such as soffits, wall voids (especially in kitchens and bathrooms), sill plates in basements or crawl spaces, and the spaces around window and door frames. Less often, they may also be found in cinder blocks, tubular curtain rods, electronic equipment, electrical conduit, and rolled-up carpeting. If the area already has a suitable area in which to lay their eggs, they may not do any excavating at all. Carpenter ants prefer infesting wood that has already been moisture damaged, but is not soaking wet. It is unusual (but not unheard of) for carpenter ants to infest dry, intact wood. Although they can do serious damage to wood, because the wood they infest usually has already been water damaged, it's debatable how much damage they do beyond what was already done by the water. Carpenter ants will eat almost anything, but their natural diet consists primarily of dead insects, as well as a sugary liquid called honeydew that is secreted by aphids tended and protected by the ants for the purpose of harvesting their honeydew. It's an interesting example of a non-human animal tending another animal for agricultural purposes. There are several species of ants that look almost indistinguishable from carpenter ants, but which live in the soil and don't attack wooden structures. Once in a while, however, carpenter ants living in a hollow tree stump will burrow through the roots and emerge from the ground, several feet or more from the tree trunk; so it's best not to assume that what look like "mound ants" aren't really carpenter ants, especially if you've also been seeing them in your home.